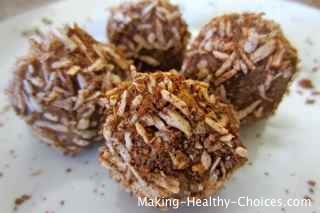 This energy bar recipe (raw energy balls) makes these delicious and nutritious snacks to quickly increase your energy or satisfy your sweet tooth. There are many energy bars on the market now but many of them contain unhealthy ingredients and/or are very expensive. Use this energy bar recipe to make a healthy treat that is so much better than anything you can buy at a store ... and you will save a heap of money. When you need a quick pick-me-up or something healthy to satisfy your sweet tooth these can be perfect. Make a bunch ahead of time so that you have them handy when a craving hits or when you are on the go. This energy bar recipe can be used to make the typical bar shaped snack or, what I prefer, is to use it to make energy balls. Energy balls are a small bite size version of the energy bar. This recipe is raw and vegan. Use ingredients that are raw and organic and for best results start this, and all recipes, with LOVE - it is the secret ingredient that makes everything better. Scroll down to see more information about the ingredients used in this energy bar recipe. Blend all ingredients in your food processor. If needed add a little of the date soak water to help everything to blend together well. Be sure to not add too much water or it will be difficult to shape into bars or balls. Once blended, shape the mixture. 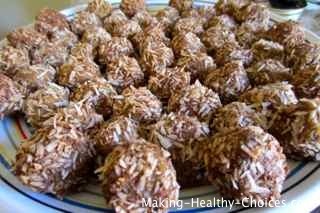 To make energy balls, roll some of the dough between your hands to shape into small balls, roll in the shredded coconut and place on a plate. To make energy bars, shape into a rectangular bar shape (use a flat edged scraper or knife to help you get nice edges), sprinkle the top and sides with shredded coconut and place on a plate. Put your energy bars and/or energy balls into the freezer for about an hour which will help them to firm up. Use a mixture of other nuts and seeds (sunflower seeds, hemp seeds, almonds, pecans, brazil nuts, etc.). Use raw organic nuts and seeds and be sure to soak them before using. Play with adding other ingredients; maca powder, lucuma powder, goji berries, ginger, cayenne pepper, figs, dried fruits (soaked), bee pollen, etc. Put a whole nut or piece of fruit in the middle of each energy ball or fold whole nuts and fruit pieces into the mixture before shaping into bars. Use different coating/toppings; cacao powder, cinnamon, lucuma powder, ground walnuts (or other nuts/seeds), whole sesame seeds, etc. Mix and match these and have fun! Dates are a wonderfully sweet food that are high in niacin, iron and potassium among many other nutrients. Dates are widely available from many healthy grocery stores or markets. We are fortunate to have a local date ranch near us where we can get fresh dates. Cashews are a soft and sweet nut. They are high in magnesium, phosphorus and potassium along with protein and many other nutrients. Cashews are widely available in most grocery stores. Coconuts are simply an amazing food. If you are fortunate enough to live in the tropics where coconuts grow you can enjoy them in abundance, all year around. Coconuts are nurturing to the entire body. If you don't live where coconuts grow then it is good to use them just as a treat every once in a while. Cacao Powder is the powder of the raw cacao bean. This is the original form of chocolate. Raw cacao is high in magnesium and antioxidants. Cinnamon has been used for ages and across many cultures for medicinal and culinary applications. It's health benefits are extensive including being supportive to the digestive system, regulating blood pressure and counteracting congestion. Cinnamon is widely available in most stores.